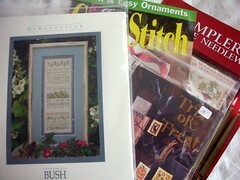 O Beautiful by Shepherd's Bush, Trix or Treat by Blackbird Designs, and two new magazines. They also have stitch-in's every third Thursday, so I may try to get to one of those. Too bad I don't live a little closer, but that's probably a good thing! :) It's also nice that they have a mall right down the street and tons of other shopping like Michaels, Target, etc. We took the boys to a Halloween thing they were having here on Treasure Island last night. 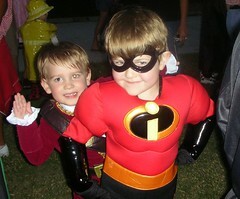 Jake was a Pirate and Bradley was Dash from The Incredibles. We didn't stay long because it seemed like it was going to rain, but the boys had fun! Well, not much else... I've been fixing my program. I actually like it better now because I made the pictures a little bigger. I still have to add a couple more binders of charts. Whenever I go through my stash like that it makes me remember everything I have!! :) Write later! 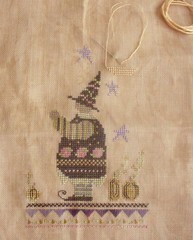 Little Witch looks very cute! Little witch is just adorable! You boys are cute too! Does Matthew have a costume as well. Finally got it figured out! A gift for my stitching friends!